When it's time to take care of all those difficult, time-consuming home improvement projects, renovations, and other various repairs, you can count on a Sears handyman. Our handyman technicians are experienced in a wide range of home improvement tasks from plumbing to decks and drywall. Let Sears handyman technicians take care of most minor to intermediate repairs so you have time for other important tasks. Give us a call at (937) 736-2445. Sears Handyman Services is able to assist you with various electrical problems, including ceiling fan replacement and repair, light fixture installation and repair, as well as LED lighting installation. Give us a call today to discuss your electrical repair needs. 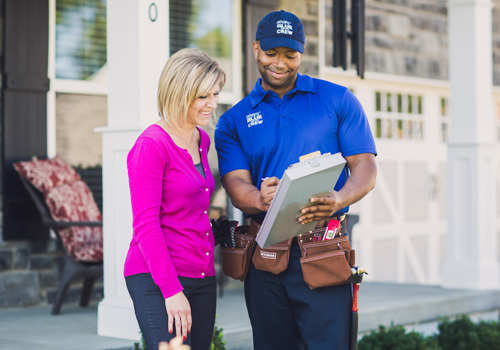 Call your local Sears handymen to discuss what other home repair and home maintenance services we have to offer! As drywall is a common construction material, many homeowners are left with unsightly nail holes resulting from items mounted on the wall. While it is a sturdy material, plaster board can break or crack if struck by hard objects such as a door knob when a door is flung open a little too hard. Don't let these repairs detract from your beautiful painted or wallpapered walls; call Sears Handyman Services to fix them instead. Thanks to Sears Handyman Services, the unsightly damage to your walls can be repaired. Don't let minor or major repairs mar your wall's look. Our handymen have the experience to patch, tape, and repair drywall quickly and easily. If you need to have new drywall installed, we can do that too! Backyard decks are often the place where family and friends get together. However, decks do require effort to keep them in good shape. Let Sears Handyman Services take care of your deck so you can relax for hours. Whether it needs to be stained and treated to prevent water damage, or it needs boards replaced to eliminate a soft spot, Sears Handyman Services is the team to call. If you want to build a deck but simply don't have the time, no problem - our technicians can even build a brand new deck from scratch. Fences are a great way to keep pests out of your yard and your household pet on your property. In addition, fences also provide your family with privacy. Trust Sears Handyman Services to install a privacy fence, traditional, white picket fence, or chain link fence. We are also available to repair existing fencing material. Bring your home to life again by painting the walls and exterior with a clean, fresh new look. Sears Handyman Services has all the tools needed to complete those time-consuming painting jobs. In addition to removing wallpaper and preparing surfaces to be painted, our technicians have the tools and skills required to paint high exterior and interior walls and ceilings.